Drew Fischer gets the latest round of Major League Soccer action under way on Friday night, taking charge of Vancouver Whitecaps versus San Jose Earthquakes at BC Place. That’s the first of 10 matches in Week 23 of the season, with a double-header on Sunday following an action-packed Saturday schedule. Chris Penso returns to the middle for a second assignment since refereeing the MLS All-Star game. It’s Red Bull Arena for Penso, where New York Red Bulls welcome Montreal Impact at 7pm ET. Impact were one of the teams to feature in our latest Play of the Week, with PRO’s Training & Development Manager Paul Rejer taking a look at violent conduct and how to ensure a correct call is made. Portland Timbers, who were also under Rejer’s spotlight, kick-off at the same time, although they’re in the capital for a trip to D.C. United. Brian Dunn, Jason White and fourth official Jose Carlos Rivero make up the team in support of Jorge Gonzalez, a referee involved in three All-Star games during his career to date. Eastern Conference leaders New York City get under way a half hour later at Columbus Crew, with a Romanian-born duo among the officials. Sorin Stoica takes the whistle; Silviu Petrescu is on fourth. Robert Sibiga has been assigned the other 7:30pm game, between New England Revolution and Philadelphia Union. 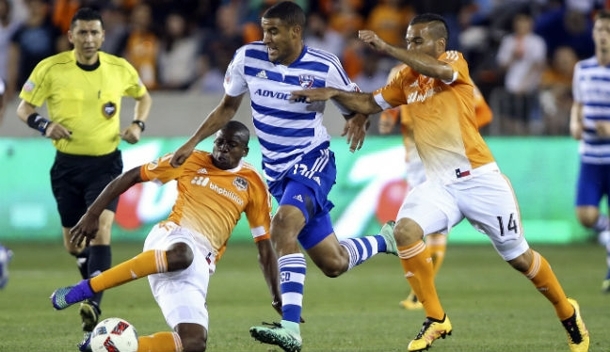 FC Dallas are leading the way in the West and reached the U.S. Open Cup Final in midweek. On Saturday night they face Sporting Kansas City, the reigning champions of that very tournament. Running the line at Toyota Stadium will be AR of the Year Corey Parker and Matthew Nelson, another of the recent All-Star game against Arsenal. Armando Villarreal referees. Hilario Grajeda and Juan Guzman complete Saturday’s referee assignments, overseeing Houston Dynamo versus Toronto FC and LA Galaxy against Colorado Rapids respectively – Frank Anderson will join brother Ian on a league-high 16 assignments for the season in the latter. Mark Geiger comes in for Chicago Fire against Orlando City in the first of the Sunday games, with that clash getting under way at 4pm ET. It’s then down to 2010 Referee of the Year Kevin Stott and his vastly-experienced team to bring week 23 to its conclusion. Two-time AR of the year Kermit Quisenberry will run the line at CenturyLink Field opposite Chris Strickland, a man who can claim numerous FIFA World Cup and Gold Cup appearances on his glittering resume.